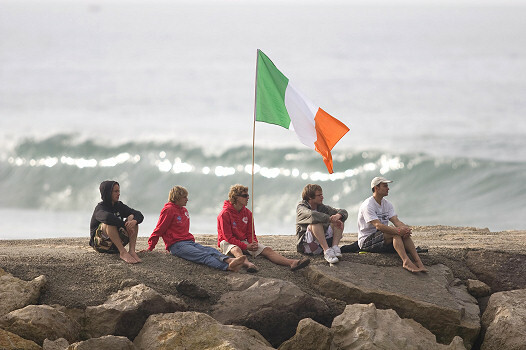 The 22nd edition of the ISA World Surfing Games started today in five foot waves at the beaches of Costa de Caparica. The first and second round of the Longboard division, along with round one of the mens and women’s Bodyboard were held. Brazilian Simao Romao, 22, led the party on a crowded Arpoador beach during the last day of the Oakley presents Rio Surf Pro International. The up and coming surfer started the day strong, posting the highest score ever in the history of the ASP WQS Arpoador event. Daniel Ross (Yamba, AUS), 25, won the Association of Surfing Professionals (ASP) World Qualifying Series (WQS) 4-Star Ocean & Earth Pro pres. by La Caja de Canarias in pumping five to six foot (1.5 to 2 meter) waves at the world famous venue of El Confital today. The ISA World Surfing Games were declared officially open today in the Costa de Caparica Sports Arena, with cheers and applauses of joy coming from more than 300 surfers from 29 countries. Layne Beachley (AUS), 36, former seven-time ASP Women’s World Champion and current No. 3 on the 2008 ASP Women’s World Tour ratings, has officially announced her retirement from full-time competition, effective at the end of the year. Former ASP World Champion C.J. Hobgood (USA) defeated Joel Parkinson (AUS) in three-foot (one meter) barreling waves at the Billabong Pro Mundaka to claim his first ASP World Tour victory in four years today.